Don’t just hand your sensitive data to anyone. Sensible Recycling is the only electronics recycling company in the Jacksonville area that follows a policy of total destruction. We do not reuse hard drives, we shred them. We offer no cost, total data destruction for your piece of mind. Our services include on-site or in-house hard drive shredding and electronic data destruction services in the Jacksonville, St. Augustine and North Florida areas. We achieve this by physically destroying your hard drives by shredding them into pieces at your location or at our warehouse. We also offer FREE onsite shredding at your location. We also hold a HIPAA Compliance certification. A serialized certificate of destruction can be provided for your records. We also provide video of the process and a representative from your business is welcome to observe the process as well. Secure Chain of Custody – Assets are recorded at the time of the pickup, brought back to the warehouse and recorded by serial number or asset tag. If either of those is available, we can tag them for you. Drives are listed by serial number from the corresponding server or computer from which they were removed. A certificate of destruction is created using the serial numbers from each individual drive. Our process is compliant:NIST 800-88 standards, DoD 5200.22, HIPAA/HITECH, Sarbanes-Oxley Act, Gramm-Leach-Bliley Act, FACTA Disposal Rule, Bank Secrecy Act, Patriot Act of 2002, Identity Theft and Assumption Deterrence Act, US Safe Harbor Provisions, FDA Security Regulations, PCI Data Security Standard and other local, state, and federal regulations. Our services are FREE. Stop paying a company to provide you with the same level of service that we provide at no charge. Sensible Recycling provides no charge hard drive shredding services. We offer one simple method of destruction to fit your needs: shredding. We offer on and offsite hard drive shredding for our customer’s convenience. Our warehouse shredder is by far our most robust machine handling up to 1500 drives per hour. We also offer onsite shredding services as well Our large shredder is located at our warehouse on 9640 Sunbeam Center Dr. Suite 3, Jacksonville, Florida. 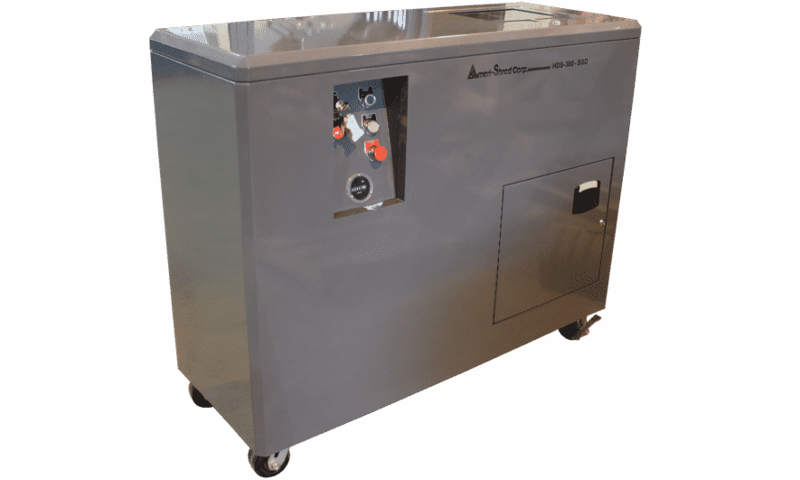 The shredder reduces the drive down to pieces less than 1/2″ in size. 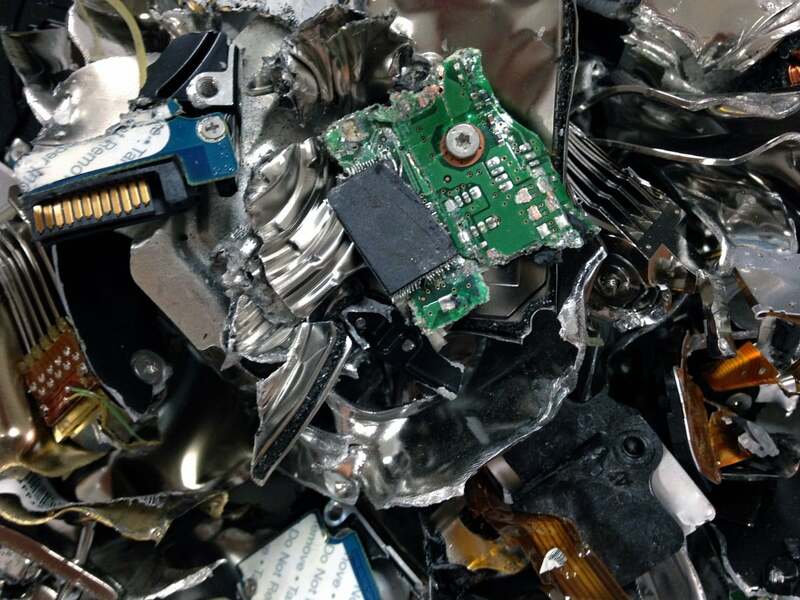 The shredding process ensures all of your data is permanently destroyed in a very destructive fashion and meets the highest standards for electronics data destruction. We offer certificates of destruction by request at no charge. Shredding is the best and safest way to ensure your hard drives and electronic data has been completely destroyed. The shredder can also destroy other types of media devices such as thumb drives, cell phones, tablets, CD’s/DVD’s, and magnetic tape. We can also provide serialized certificates of destruction and can video the process to conform to any regulations. When a business is searching for a company to handle recycling computers, IT equipment recycling, and data destruction often they are offered some value back for the material they are disposing of. Remember that those machines and equipment were licensed to that business and that business only. Even if those computers or servers are refurbished, that serial number or asset tag is going to always point back to the original company that purchased them. If by some reason years down the road, those refurbished machines are disposed of again and they are not being disposed of responsibly and end up in a location in another part of the world where they don’t belong, that serial number will point back to the company that originally bought the machine. Sensible Recycling does not refurbish. We alleviate the possibility of that very scenario because we dismantle most items we receive for recycling, and we NEVER wipe hard drives. We can also offer value back for companies that are refreshing or retiring computers or IT equipment. Find out more about our asset recovery program. We offer free offsite shredding services at our warehouse location. This is a totally free service. 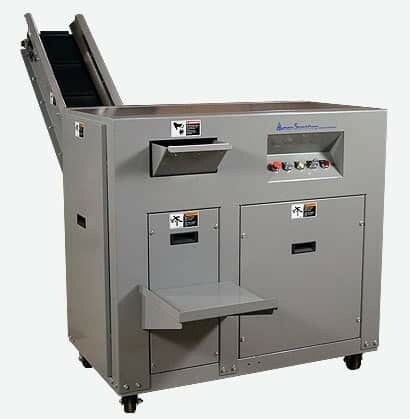 Using the AMS 500 hard drive shredder, we can destroy up to 1500 hard drives/hr as well as any other data related media that fits in the machine. Feel free to observe your drives being shredded by this powerful hard drive shredder free of charge. We offer free onsite shredding services. This is a totally free service. Watch your drives being shredded onsite for the ultimate in data security. Why pay to have another company come out and do the same thing we can do for free? We can also scan your drives onsite and build your certificate of destruction while we shred your drives. Imagine, no waiting to receive the paperwork that other companies take weeks to generate. We can also shred magnetic tape and solid state devices as well. Another option is our Data Security DB-4000 hard drive bender. This machine is an NSA certified method of hard drive destruction. The machine physically destroys your drives by bending them in half which breaks the drive and renders it useless and the data unrecoverable by any methods. The DB-4000 is mounted on a cart and the machine is battery operated which allows us to take it anywhere. The machine offers a silent destruction process that can be completed in an office setting. This service is performed FREE of charge. Electronic media that contains EPHI should be rendered “unusable and/or inaccessible”. Document the “receipt and removal of hardware and electronic media that contain EPHI”. EPHI and electronic media such as computer hard drives should be rendered unusable and/or the data should be inaccessible. All digital media coming into or leaving the custody of the covered entity should be properly inventoried and reported. If hiring a business associate to perform data destruction services, the covered entity must enter into a written contract or agreement. EPHI should remain in the custody of or supervised by an authorized employee. Sensible Recycling has the ability to come to your location and physically destroy your hard drives. We will also supply you with a serialized certificate of destruction for all of the hard drives that we destroy. If you choose to have your material destroyed off-site we have you covered. Once your material enters the custody of Sensible Recycling, it will remain in a secure lockbox until it is transported to our secure facility. The material will remain locked until we destroy it. Destruction is filmed and documented, after which our clients will receive a copy of the destruction video and serialized certificate of destruction.